As part of the Gone Green 2016 series I asked some of the bloggers from the Ethical Blogger Network to help me out by lending me their words and talents for these posts. One such blogger is the lovely and charming Ashlee Uren from One Fair Day who is part of the leadership team with me at EBN. She was kind enough to write this guestpost and share her recipe for Any Greens Pesto. You can follow Ashlee's adventures in sustainable living on her blog, One Fair Day, here. Below are her words. One of my sustainable resolutions for the year is to start composting. Recently, as I assessed what size compositing bin I might need, I became aware of how much food I waste each week. I'm not just talking about the scraps I bin at the end of a meal - it's also the potato peel, the carrots that got lost on the bottom shelf and went soft, the egg yolks separated in baking, and the last of the homemade tomato sauce that I couldn't think of an immediate use for. Part of living more ethically is creativity; so along with my resolution to dispose of my waste sustainably through my new composting endeavours, I also resolved to reduce my waste in the first place. 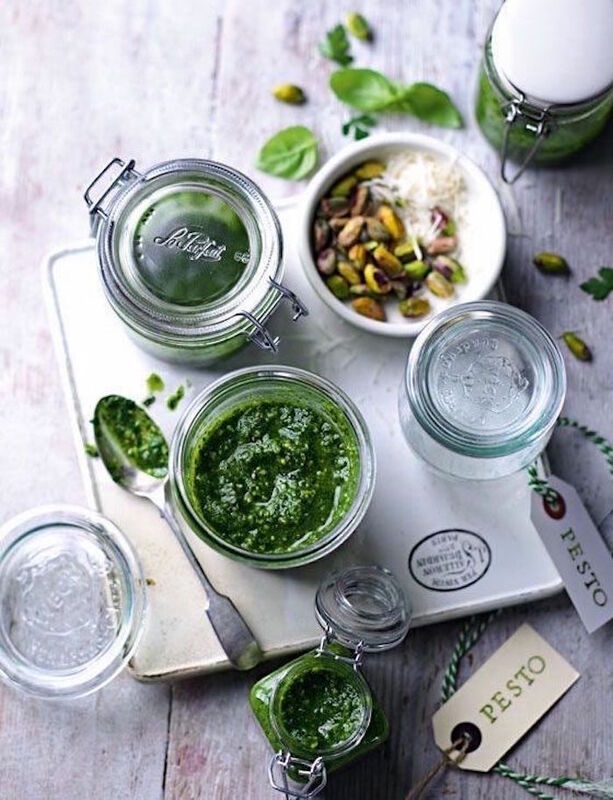 If you have a blender, you can very quickly create this simple unconventional pesto in a few minutes using any greens. And I mean any greens - you can use the greens from the back of your fridge that are going bad, or the vegetable leaves that you would usually toss in the trash. You can use one type or any combination of greens based on your taste, what is in season, or what is in your fridge! 1/4 cup basil or parsley: choose your taste preference. Basil will make this pesto taste more like a traditional pesto. 1/2 cup of any greens that would otherwise go to waste: i.e. celery leaves, radish leaves, beetroot leaves, end-of-life kale or spinach. I wouldn't recommend using any more than 1/4 cup beetroot leaves, as it will overpower the other ingredients. Place the nuts in the blender and chop roughly. Add the garlic, basil or parsley, washed greens, parmesan cheese (if using) and1/2 cup of olive oil and mix until combined well. Add the lemon juice and rind and stir through. If the pesto is thick and sticky, stir through 1/4 cup more olive oil. The idea for the recipe was sparked by a friend, who told me about the idea after reading it in Simpilicious by Sarah Wilson. I enjoy this pesto on crackers, as a dipping sauce for carrot or celery sticks, on toast with avocado, cherry tomatos and sea salt, and mixed through pasta. It keeps in the fridge for 4 to 5 days and also freezes well - simply put it in an icetray and use it as you need.